This May 2017 a team of 30 employees from long-time Influential partners Hachette are taking on the ambitious cycling challenge of cycling 200 miles from the Hachette office in London to the Paris office. They will be supported along the way by suppliers, friends and family. The riders are also being urged along by a great cause, raising money for the National Literacy Trust, and by the support and best wishes of their sponsors. 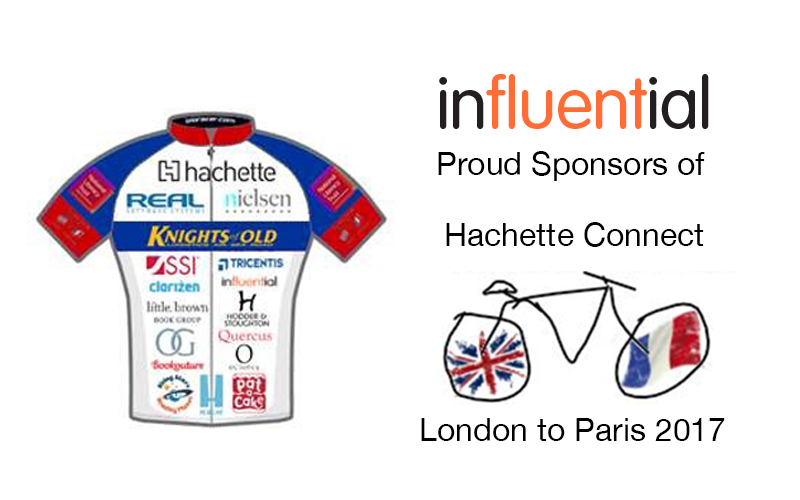 Influential Software are long-time partners of Hachette and proud to be shirt sponsors for this worthy challenge.Everyone at Influential would like to wish all the riders and those supporting them all the very best of luck, a safe and successful journey to Paris. A third of disadvantaged children in the UK leave primary school unable to read well enough to succeed in secondary school, severely reducing their chance of leading a happy and successful life. The National Literacy Trust is dedicated to raising UK literacy levels and works with schools, parents and local communities to increase literacy levels in the poorest communities across the UK. All donations from the Hachette Connect event will help disadvantaged children gain the literacy skills they need to succeed in life.Thanks for visiting our team fundraising page. If you would like to donate please visit the team fundraising page, Hachette Connect Team on JustGiving. The team are posting regular updates as they take on the challenge. You can follow events as they unfold, discover more about great charity cause and even read about the individual adventures of the riders themselves Visit the Hachette Connect website to find out more. You can also follow the team directly on social media. Once again, good luck to all involved from all of us here at Influential Software!